Recorded live at The Café Montmartre, Copenhagen, Denmark on March 3-6, 1991. 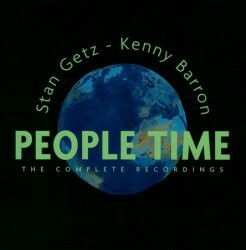 When the Stan Getz/Kenny Barron duo album People Time was first released in 1992, the year following the tenor saxophonist’s death, critics and fans were astounded at Getz’s powerful playing (even though he was weak from the cancer that would take his life within a few months), buoyed by the brilliant piano playing of Barron. Finally, the decision was made to release all seven sets by the duo recorded during their four-night gig at Cafe Montmartre in Copenhagen in this seven-CD box set, with the addition of new, detailed liner notes by Gary Giddins, while Kenny Barron’s notes from the original release are present as well. Aside from one splice to replace a passage where Getz dropped out for a measure and a few moments when the physical strain on the leader is showing, the performances are among the best of the saxophonist’s career. This expanded release is clearly not a vault-opening stunt to sell previously unissued music, but an opportunity to hear the high level at which Getz and Barron played throughout their duo engagement. The 48 tracks include two dozen different songs (some played multiple times), but each version of the repeated songs stands on its own. While the selections chosen by Getz for the original two-disc edition of People Time are among the best performances, the new material is hardly second-rate. Among the highlights of the previously unissued songs are two stunning versions of Thad Jones’ “Yours and Mine” and a haunting shorter take of Benny Golson’s “I Remember Clifford,” along with a playful “I Wish You Love.” As an added bonus, the first set’s evening opener, “Night and Day,” is included at the end of disc seven, even though the microphone setup was still being adjusted during the opening minutes. Fans of Stan Getz should consider this box set an essential purchase.